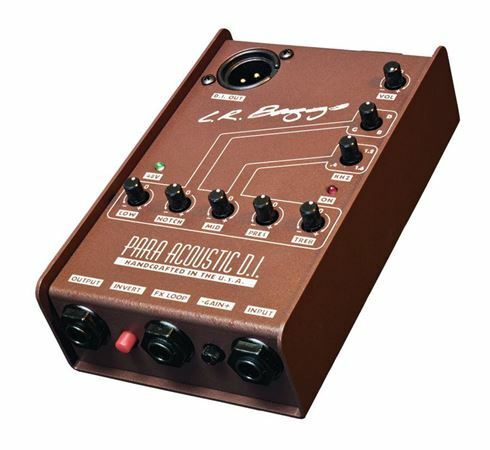 Shop LR Baggs ParaAcoustic DI Active Direct Box and Preamp from AMS with 0% Interest Payment Plans and Free Shipping. The Para DI is the award winning preamp/direct box that fits right into your string pocket and gives you a 5-band EQ with tunable notch and midrange. Whether on stage or in a recording studio the Para DI brings out the best in any pickup. As a musician, you are an artist...a communicator. The notes, chords, rhythms, and melodies you play on your instrument need to be heard loud and clear by your audience. Whether your focus is getting the best tone from your instrument on stage or in the studio - L.R. Baggs products can help you sound great. They've spent 20 years developing the best sounding pickups and preamps on the planet. This is the sound you've heard from players like Vince Gill, Pete Townsend, Doyle Dykes, Eric Johnson, Phil Keaggy, Earl Klugh, Alison Krauss, Lenny Kravitz, Kathy Mattea, Natalie Merchant, Jean Luc Ponty, James Taylor, and countless other talented players around the world. So...are you ready to find the right gear to take your tone to the next level? Their electronics are the product of 20 years of relentless improvement and the quest for perfection. Their quality has been recognized with great reviews and numerous awards. They have also garnered a well deserved reputation as the most advanced and best sounding circuitry for pickups on the planet. They are magic. You can be assured that you will sound your absolute best when you use any L.R. Baggs preamp. The Para Acoustic D.I. is a studio quality direct box combined with a feature packed, state-of-the-art preamp and equalizer. L.R. Baggs' proprietary Quasi-Passive EQ circuitry is totally transparent and allows control over voicing without sacrificing tone - a big advance over conventional equalizers. It brings out the best in any pickup and will make you sound better. 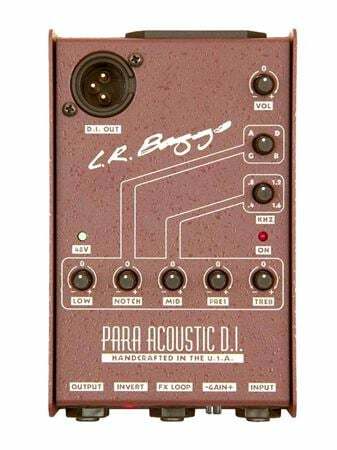 The Para Acoustic D.I. is quickly becoming a key component in the acoustic setups of both professional and amateur musicians alike. Great preamp/DI especially for very passive pickups like a Realist. Virtually indestructible with easy control interfaces. As stated before, it's built for abuse (but you'll want to baby it). The Para DI is an outstanding quality product, built like an armored car, with extreme versatility. Provides infinite versatility to your acoustic tone - makes an acoustic sound acoustic through any PA or amp system. Nice matte textured brown - subtle and satisfying. The Para Acoustic DI is a direct box plus dynamite preamp for acoustic electric instruments. This unit should last for years. Battery life is extended greatly if you unplug the instrument cable between uses. Otherwise, the battery draws down faster. This preamp has a heavy duty metal case, and the controls work well, though the knobs are small. Bigger knobs would mean a larger unit to tote around, so I can deal with that. My earlier model still works great, so I can say with confidence that this DI/preamp holds up well. I have owned an earlier version of this preamp, but the addition of the "GAIN" feature puts it over the top. The older model was perfect for a passive pickup, but it was too hot for an active preamp pickup. This newer model works equally well either way. Knobs work well, and inputs, outputs and switches are sure to the touch and solid. It can be really hot with an active pickup, but just adjust the "Gain" to suit, and it mellows right out so you have lots of volume control. You can get almost any tone you want from this preamp. My Gibson J-45 sounds great though this box, balanced and the notch filter does a decent job of feedback control. The crinkle finish is quite professional looking and seems to last. Insert a 9-volt battery, plug in an instrument, and start sound shaping. Just What I Was Loooking For !! Very well made. Sold construction and seems it will last. Its steel body gives it a quality feel to touch. I have not used this more than a few weeks so I can't really give you great in site here but again it seems to be very well made with quality materials. I have never really thought about a DI box having these features of providing such shaping tones for my acoustic. When I discovered it and read the reviews it was the best choice for me in what I needed. Size matters to me when gigging. I gig one to two times a week and I like to make the least amounts of trips as possible when it comes to moving gear but I want to have the guns on me at all times when it comes to sound and being my best. This little box is just that, small but wow ! you truly get a awesome piece of equipment for a real reasonable price. This is why I bought this unit. I am using a Gibson CL-45 that has only a pizeo under the bridge. No preamp and using it to play live I have found myself lacking in acoustic tone. I thought the answer was a 70 pound, 800 dollar roland amp. Which helped but did not help my back any and the tone was still lacking. ok ..No joke.. I plugged in the di box and with in 5 minutes my mouth hit the floor and I my ears overjoyed to what they were hearing. I must have played for 4 to 5 hours that day because I was so inspired by the tone. I have finally found what I was looking for. Can't wait to try it on my parker nitefly. Pouder coating, should hold up great. Want your acoustic(s) to sound good. No matter which of my acoustics I plug into this thing, I always seem to be able to tweek in that sweet spot which gives me the ability to give all my guitars that same basic flavor before I send it for processing. I always have the gain knob all the way down though, kinda wish it had a little more attenuation, All my guitars do got active pre-amps which I think probably isn't the exact intended use - but try it that way and you won't be quite as satisfied with that plain vanilla direct box anymore. Completely worth every single penny!!!! !